INICIO / Event / NAO VICTORIA FOUNDATION HAS REQUESTED TO ALTUM, THE DESIGN PROJECT AND WORKS SUPERVISION OF NAO SANTA MARIA, ON THE OCCASION OF 525 ANNIVERSARY OF DISCOVERY OF AMERICAS. 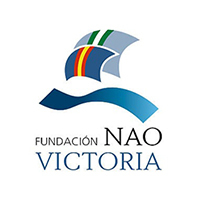 The Nao Victoria Foundation is a non-profit entity specializes in promoting and spreading historical events, which are supported by the construction of historical ships (the Nao Victoria and El Galeón) that are sailed throughout the world’s ports. The vessels are a powerful, unique and very attractive marketing and educational platform that have been used successfully to support great world events during the last decade. 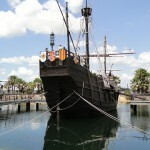 With same scheme as in Galeón project, ALTUM will be in charge of engineering project and works supervision of NAO SANTA MARIA, that will be built at Palmas Shipyards (Huelva-SPAIN), with an estimated period of fifteen months. 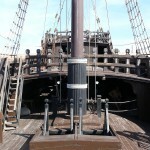 Vessel will be built respecting original lines and details with maximum historic rigour. 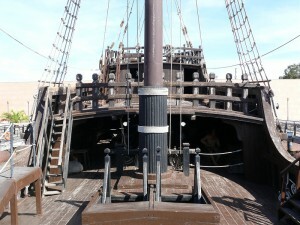 Construction will be carried out by implementing an innovative system in shipbuilding of historical ships, combining GRPF materials for hull, and wood coating. This novel technique contributes to improve maintenance costs, environmental impact and durability. Launching of hull is expected to be on next October 2017.